THQ's upcoming titles face questionable futures. 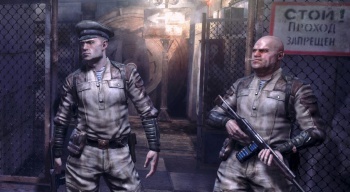 With THQ waist-deep in financial trouble, the future of the highly anticipated Metro: Last Light seems uncertain. Or, at least uncertain enough to prompt GameStop to remove the pre-order option from its digital distribution system, Impulse. For now, the physical version of the game remains available to pre-order on the retailer's main website. "Essentially, due to THQ's current financial situation and uncertainty of delivery, in order to protect our consumers we removed the ability to pre-purchase that specific game," a GameStop representative told GameSpot. THQ's financial woes have been well publicized as of late, and a bankruptcy auction is tentatively scheduled for January 22. On that date, each of THQ's individual properties will be auctioned off in a piecemeal fashion, allowing other companies to snap up the IPs they desire. This, of course, leaves the upcoming release of Metro: Last Light in question, as well as other scheduled titles like South Park: The Stick of Truth.